Today was party day. Thanks to all those members who made it such a success. There were dances from the Michael Jackson Tributes, a Ukulele band, a comedian, songs from a folk group, a Wigan song from Jimmy and a solo by Colin, music from Arthur and his brother, various quizes from Linda and tombola prizes for all. It ended a great year for us in style. Enjoyment was enhanced with some community singing from the audience and a hearty hotpot and cakes. Happy Christmas to all our members and looking forward to another great year. If you would like to look at the photos go to the home page. You will find them on the Christmas Party 2018 gallery. On Thursday 29th November Diane and Anna attended the Ambition for Ageing panel to award investments from applications written by local community groups for this year. While we were there we were able to thank Age UK Wigan for their continuing support and funding granted to us last year. With our grant we have been able to make good use of the technology we purchased to help us in our artwork projects this year. Tony continues to help us develop our skills. A reminder to members that Diane is collecting artworks for the exhibition in the new year about the life and times of miners and their families. 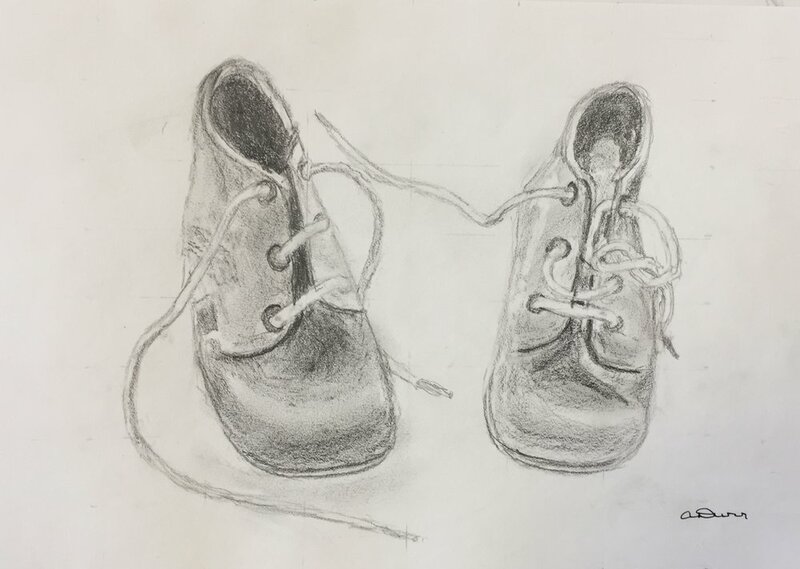 Please will members remember not to leave their personal belongings in the art store as there is no room, especially as artworks for exhibions are stored there. The two frame sizes that Diane spoke about on Thursday for the Forthcoming Astley Mining Museum art display depicting ‘The life and times of miners and their families’ are as follows. These are the inside aperture measurements of the two different masks so that you can paint your art work to fit. 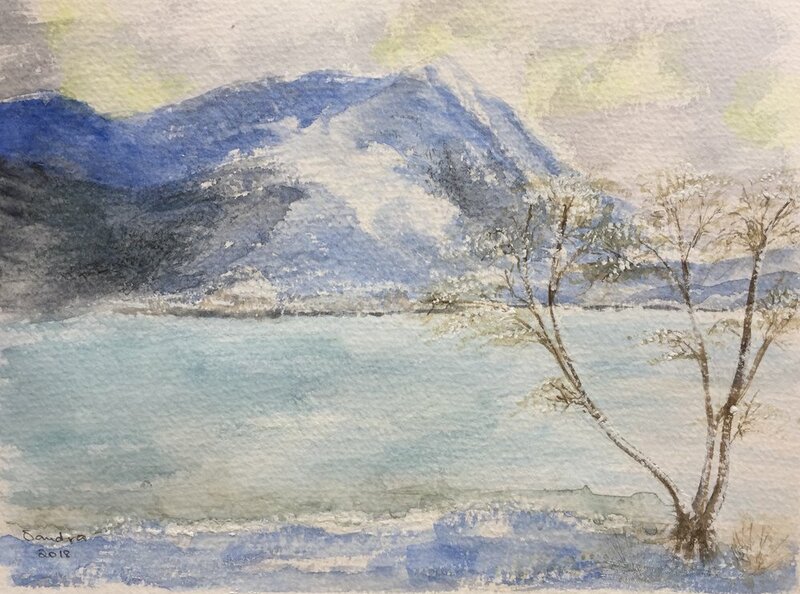 Artist Steve Williams joined us this week to run a workshop painting a snowy scene using watercolour. Steve took the session stage by stage giving everyone chance to follow his instructions. The painting was done in a loose style using mainly light blue, light reds and brown. 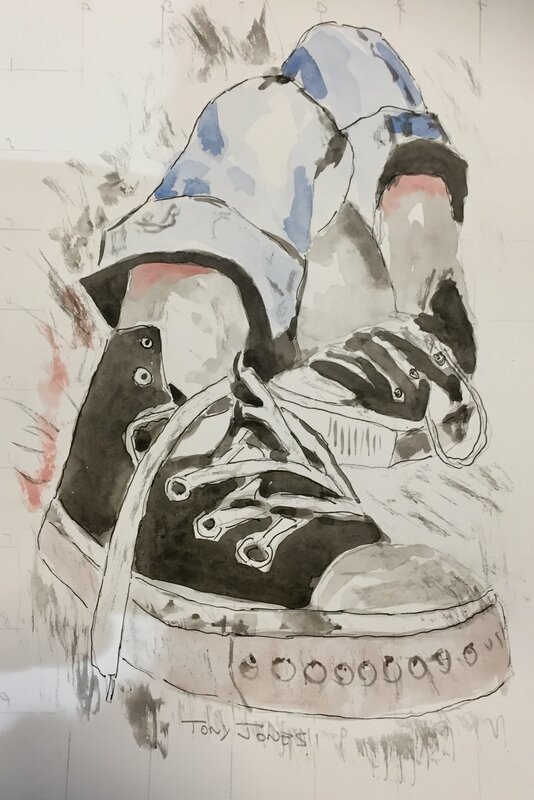 No masking fluid was used, retaining the whites throughout the painting. Here is Steve painting along with his finished painting. 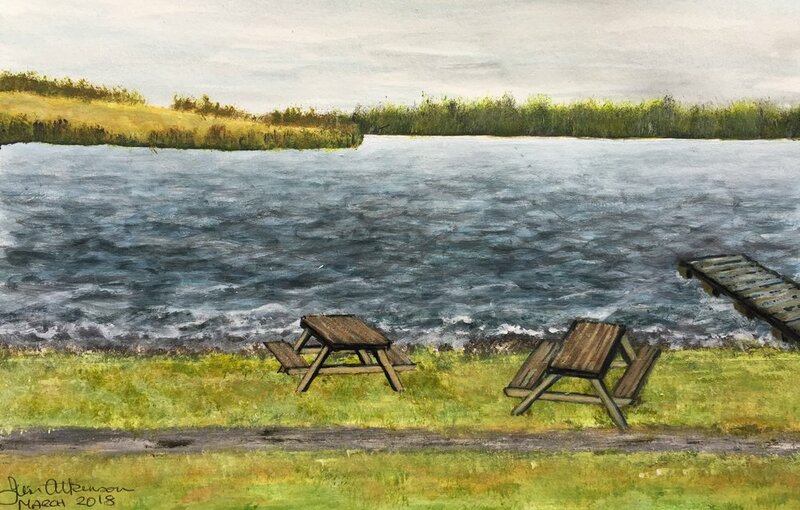 This a set of finished painting completed on the day by members, other members not completed the painting will bring them again. Other paintings by members: From left to right. Pauline Griffiths, Sue Benson, Tom Mellows, Steve Warbis x 2, Angela Dunn, Arthur Powell, Anne Houghton and Tony Jones x 2. Click on an image to see a larger picture. From left to right: Jim Atkinson (2 x using Brusho), Tony Jones ( 2 x using Acrylic pouring), Sandra Surrage, Steve Warbis, Tom Mellors, Ian Scott, Tony Triscari, Arthur Powel, Jimmy Bamber and John Morris. A much more detailed picture can be seen in the artists work area. They Include: Borsdane Wood, Hindley; The stone lion at Haigh Hall; Spinners Mill in Leigh; the canal; St Wilfrid’s Chuch in Standish to name a few. This a video of the completed wall. A photograph of the complete wall. This Week members were doing catch up. Many different mediums were in use today with our very own artists finishing off work from previous weeks. Here are some of the finished results. First four finished paintings of the girl with the sparkler from Anne Houghton, Steve Warbis, Tony Jones and Tom Mellors. Other work by Chris Bury, Janet Bilsbury, Jimmy Bamber, Sandra surridge Tony Jones and Tom Mellors. An early entry for the mining museum by Jim Atkinson. Astley Pit Museum Exhibition for March 2019. Could members please submit artwork (A4 image) based on miners and their families by January/February. Victorian photocopies illustrating the theme are available at the club on which you may wish to base your work. Please keep the work in the art cupboard without frames, so we can reuse the ones already in use at the Astley Pit Museum. Thanks Diane. 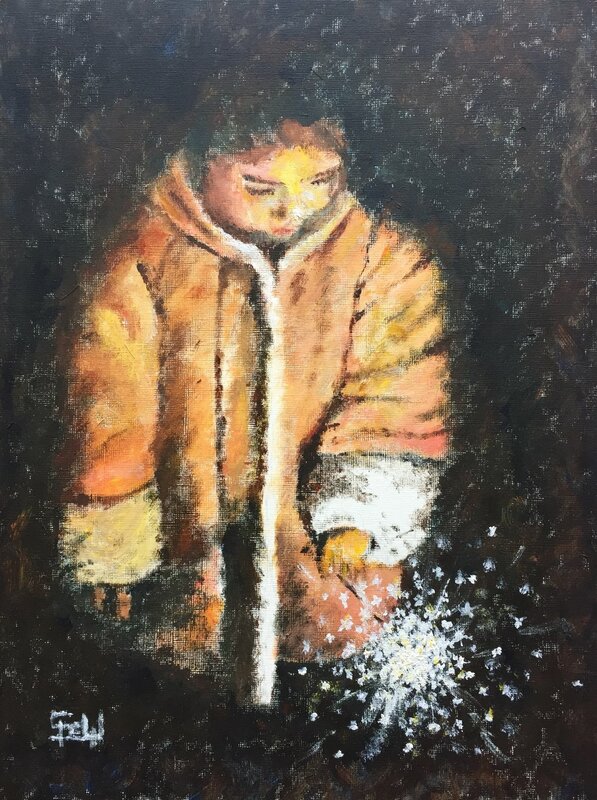 Janet Bilsbury provided us with a wonderful workshop demonstrating to us how to paint a girl holding a sparkler. The medium used was acrylic. This is Janet showing the process of layering the paint to produce the blending technique. This is a collage of all the finished paintings, a complete set can be seen in the ‘Workshop folder’ or Click here. We also had the usual paintings done by our members at home. The first by Tom Mellors and the rest by Tony Jones. On Friday 19th October 2018, Golborne and Lowton members Anna and Diane attended Age UK’s Health and Well Being event at Leigh Miners Welfare Institute. A total of 25 community groups were represented and we had the opportunity of promoting our art group and supporting the event. We made useful connections with other community groups including Altzeimers Shoulder to Soldier, Happy Times and Memorable Leigh. We discussed prospects for exhibiting our work at some of these community venues and putting on demos. Several people also expressed interest in joining our group. Members can submit a piece of their work for display at Golborne Library. Diane will collect the work if you bring it in for Thursday 8th November. 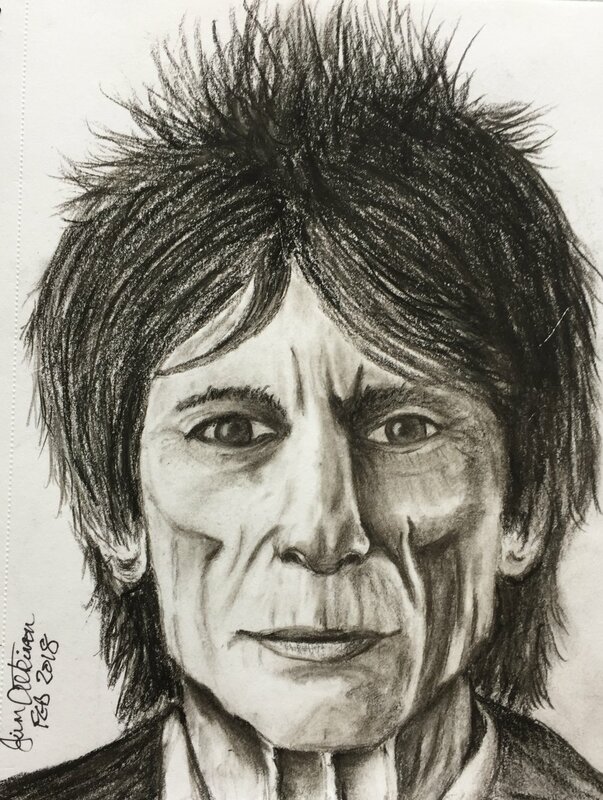 if you don’t see Diane then please put it in the art cupboard, second shelf down, for collection. Preferred size is A4 image. We will need the name, title and medium please. Thanks. Ian Scott again gave us a first class demonstation / workshop on the topic of ‘Bonfire’ in pastel, first laying a grounding of black and grey for the first layer. Then adding colour for the bonfire and smoke, followed by trees and reflections off the fire on the leaves. Finishing of with figures and fireworks. Many members joined in with this activity and produced some excellent results. This is Ian with his finished painting, and below a complete set of members contribution. A complete set of the paintings, a larger set can be seen in the work area by clicking here. Other work brought in by members, Mick Muddimer, Jimmy Bamber, Jan Johnstone, Sue Smallman (4), Chris Bury (2) and Linda Todd. Ian Scott provided us with a wonderful workshop painting a dancer using pastels. Many members joined in with the activity. Here we can see Ian painting along with his finished painting and our own artists busy with there own paintings. A collage of all the dancer paintings completed today. Individual paintings are in a work folder called ‘Dancer’ and be seen by clicking this link. We had much more talent from our members. First from Sue Smallman a selection of Brusho paintings applied to stamp stencil followed by a three paintings using a process called Acrylic pouring. More talent was demonstrated from our new member Sue Benson. Further work brought in from members completed at home. From left to right: Jimmy Bamber, Mick muddimer, Steve Warbis, Tony Jones, Tom Mellors (2) and Tony Triscari. A reminder to everyone about an exhibition of work by Eric Tucker. He has the name as the secret Lowry. He was an unskilled labourer who left school at 14 and died alone aged 86. 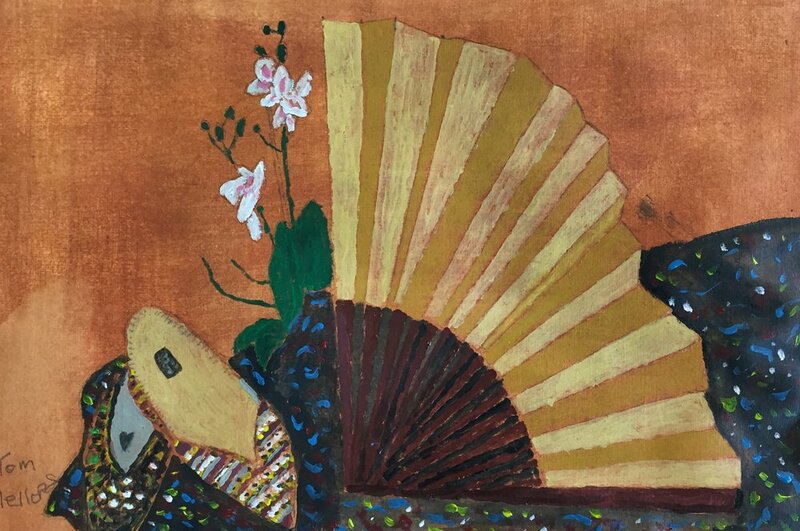 He left a legacy of 400 paintings which are now being exhibited. Steve Warbis brought in a slide show of his work and reminded us that Eric’s high quality artwork has been recently shown on the television. Most of his pictures feature scenes from smoky pubs, tumbledown terraced streets and factories and showing flat capped locals with their wives. His house is open to the public for two days only to view his work if you are interested. This Saturday 27th October from 10 a.m. to 6 p.m. and Sunday 28th October from 10.a.m. to 4 p.m.
Todays meeting was all about catchup, member finishing paintings from last week or completed from previous weeks. Many different types of medium were in use. Watercolour, Acrylic, Pastels, oil and mixed media all played there part. Here we can see some examples of the days work. Paintings left to right, Tom Mellors (x2), Tony Triscari, Jan Johnston, Sue Smallman, Jim Atkinson, Sandra Surridge, John Morris, Chris Bury (x2), Angel Dunn, Steve Warbis (x2) and Tony Jones (x2). We have two by new members Sue Benson and Pauline Griffiths. We had a guest Artist with us today. Chris Beesley demonstrated with a workshop how to paint a swan using cling film to create the waves. He did the workshop stage by stage, after drawing an outline of the swan and then dividing the blank canvas into four equal horizontal parts, we started at the top of the painting using cerulean blue and a little Cobalt blue then stretched cling film across the paper to create the waves in the water. working further down and adding more Cobalt blue to make the water darker and including some Sap green. further down some Paynes grey was added to the mix. On the bottom section the cling film was stretch in an upward direction to give the appearance of water being pushed away. finally completing the swan using a mix of rose Madder and lemon yellow to produce a weak solution of lilac and a stronger mix for the darker areas. Paynes grey and orange was used for the beak and head. Here we can see Chris doing the workshop together with his final painting. All the completed paintings. Click for a larger picture. We also had work completed over the last week. First some paintings by Chris Bury using Tissue paper to produce a relief texture to the painting. A couple of Dancer paintings one by Chris Bury, Anne Houghton and Sandra Surridge and two others by Sandra. Two paintings from last week are by Tom Mellors. Coming up will be an additional exhibition for Astley Mining Museum. This time the focus will be miners and their families. You may find the heritage gallery on the home page has some relevant photographic materials you can use. The exhibition is planned for March 2019. As a club we are going from strength to strength. We all work together with the commitment to serve our community through exhibitions and by giving donations of artworks as well as providing a social and welcoming meeting place each week for members where we paint and draw. We have had a very successful year financially and our membership has been maintained. We have benefited from a grant from AGE UK Wigan branch which has enabled us to buy a new iPad, a digital pen as well as some frames and mounts for exhibition. This means that in the future the Apple Store at the Trafford Centre will provide us with a course to teach us how to draw, paint and sketch digitally! We have successfully held three exhibitions this year in the community. As you see below, one of them being Astley Pit, the others at AGE UK Wigan exhibition at the DW Stadium, Wigan and also at Leigh Miners Institute. Unfortunately, our chair, Jan Jonston, our vice-chair John Prince, as well as a committee member Ian Scott are retiring from the committee on health grounds although they remain honororary members. We owe them all a huge debt of gratitude for their hard work over the years and we will celebrate with them at Christmas. This paves the way for a restructuring of the committee and a welcome to new members for the forthcoming year. All of us are looking forward to using more technology, being inspired by our visiting artists who provide demonstrations and workshops. In the new Year we enjoyed painting holiday at Llandudno and in the summer we went to Speke Hall in Liverpool. Thanks to all the committee for all their hard work this year. New members are very welcome and no previous experience is expected. Just come and have a go, we all help each other! Golborne and Lowton Art Group donated the proceeds of sales of our artwork amounting to £120 to Astley Pit Mining Museum. Anna and Diane were welcomed back to the museum by Steve and Marilyn on 27th September 2018 following the group’s exhibition at the pit in the visitors’ centre. Steve told us that our work sold very quickly following the start of the exhibition in June. The artworks that were sold are: Entrance to the mining museum in pastel by Colin Lowe; Pit-head, watercolour by Chris Bury; Mine Entrance, acrylic, Jim Atkinson; Astley Pit-head, acrylic Jim Atkinson; By the Light of the Moon, acrylic and pen, Tony Jones and Going Home by Tom Mellors. Works currently exhibited at the visitor centre are: Pit-head 1 and 2, Steve Warbis; Going to Work, Mike Harrison; The Wheel, Joyce Brown; Wood Truck and Engine House, Diane Bloxham; Tony Triscali; Truck Stop, Annie Jones; Nuts and Bolts, Chris Bury; Awaiting Renovation, John Morris; Winding Drum, Anna Dawson; Shaw’s Yard, Tony Jones. The works will remain until replaced by other artworks on the subject of miners and their families. Steve Eckersley pointed out that relating our work to Astley Pit made it particularly relevant. Today was a free and easy day with members painting in any subject and medium from flowers to landscapes and people. Here is a selection of paintings from the day and from members that painted at home during the previous week. Reminder to everyone AGM is on the 4th October starting at 11.00 a.m. If you are interested in serving on the committee or wish to nominate someone please complete your voting slip available at the club and hand it in next week. The AGM agenda covering all the events of the past year will be available next week. If you wish to add any topics please contact Anna Dawson. Two paintngs to feature are one from Linda Todd of a lady called ‘Henri’ completed in Pastel. Also a watercolour painting of a Mersey Ferry by John Morris. A contigancy of the committee went today to Leigh Sports village to collect a cheque from Age UK to help purchase an iPad and other commodities for the club. Those in attendance were Tony Jones, Anna Dawson and Janet Bilsbury as well as a number of staff from Age uk including Martine who liases with us and helps to put the bids together. The picture shows us collecting the cheque. Artist Jim Bickerstaffe joined us today to demonstrate how to paint in an impresionistic way. Jim provided two demonstrations, the first one was typically in a Piccaso style. The second was a loose watercolour of jimi Hendrix. Here we can see Jim Bikerstaffe painting. We had a lot of interest in the Picasso style of painting, here is a collage of all the members paintings. Click on an image to see a larger size. We also had many other paings done by our very own artists. Left to right: Angela Dunn, Jan Johnstone, Tom Mellors (3), Steve Warbis (2), Steve Warbis (2), Anne Jones and Chris Bury. We had great challenge today. Janet provided a photograph of an Indusltrial installation and demonstrated to us the method of using a pallet knife to produce the correct result. Many members joined in with the exercise and produced some remarkable rersults. Here is a collage of work done on the day. Other work done on the day or during the week by. Tom Mellors (3), Joyce Brown, John Morris and Chris Bury's sketch of Speke Hall. Club members took a day out on a field trip to Speke Hall, Liverpool. Some members took advantage of doing some drawing, others just enjoyng the day out. We have plenty pictured of the day in the album section. Click here. This a picture video of our visit. We have a few pictures as a taster. Click the pecture to see it full size. Also one member Steve Warbis produced a couple of watercolour paintings of the warefront overlooking the river. We had a very productive day at todays meeting, continuing with 'Under the Sea/Water theme' Janet demonstrated to us how to paint a goldfish using acrylics. Many made determined efforts to produce an excellent painting. First we see Janet doing the painting along with her finished result. Members developed their own paintings using their own interpretation all producing excellent results. From left to right Anna Dawson (2), Anne Jones, Anne Houghton, Jimmy Bamber, Rita Hill, Sandra Surridge, Steve Warbis, Tony Jones and Tony Triscari. We had a selection of other paintings from our member artists. Four from Steve Warbis and one from Tony Tricari. We also have a wonderful face study from Lynda Todd in pastel worthy of a showcase of its own. Along the lines of our months theme of sea, we had a few paintings from our members. First a seascape of Oban in Scotland by Jimmy Bamber and two seascapes by Mick Muddimer. Paul Foster shared a video with us on Facebook. drawing a Rhino using pastels. Here it is. Continuating on from last weeks theme of 'Under the sea" and using ideas from Elaine fox, members produced some excellent work. Many of a Turtle as suggested by Janet. 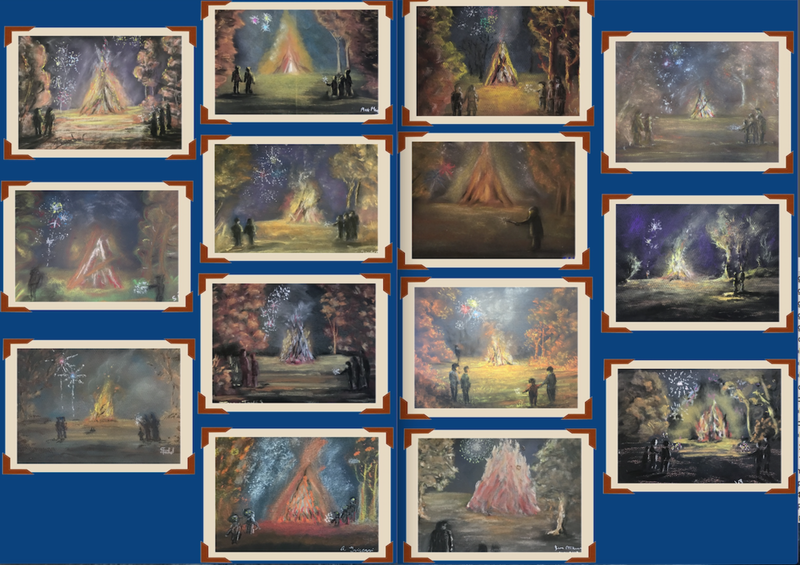 Here are the paintings produced for the theme. The paintings were by, Janet Bilsbury, Jimmy Bamber, Mick Muddimer (2), Steve Warbis, Tony Jones and Tony Triscari. 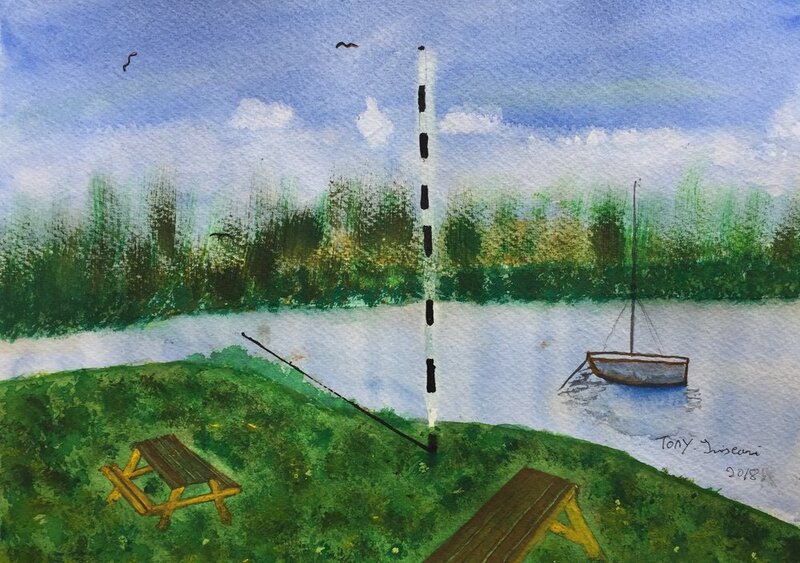 We also had a number of paintings completed by our members on the day or from from past weeks. Click the image to see a larger picture. Painting from left to right, Anne Houghton, Jim Atkinson, Sandra Surridge, Tom Mellors and Colin Lowe. 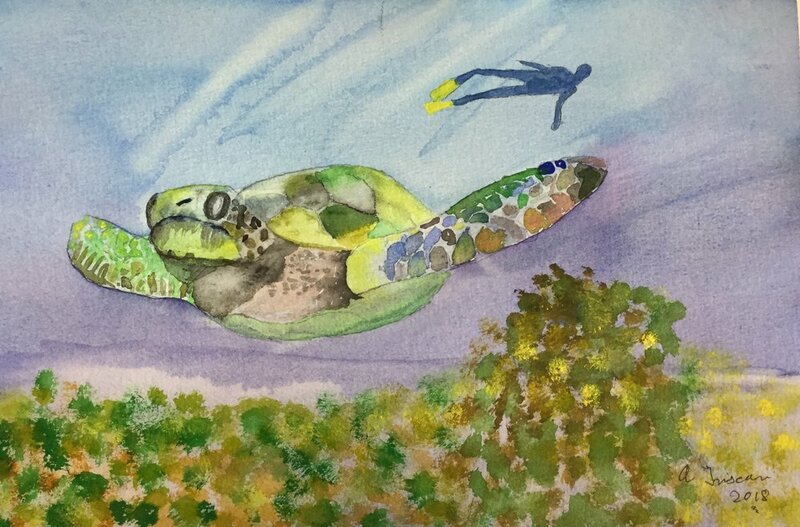 We had a guest artist, Elaine Fox with us today, Elaine uses many mediums but today chose watercolour to demonstraite to us how to produce an underwater effect to coincide with our under the sea theme of the month. The demonstration was broken down into many steps to allow members to follow along with the process. Here we see Elaine talking and demonstraiting to our members. At the end of the session members produced a varied collection of painings using Elaines method. We also had two wonderfull paintings brought in my members. Both produced using water soluable oils. First the moon scene by Jim Atkinson. Secondly the flower arrangement by Tony Triscari. Both images can be enlarged by clicking on picture. Ian Scott demonstrated to us on how to do a pastel painting of a wofl howling at the moon. 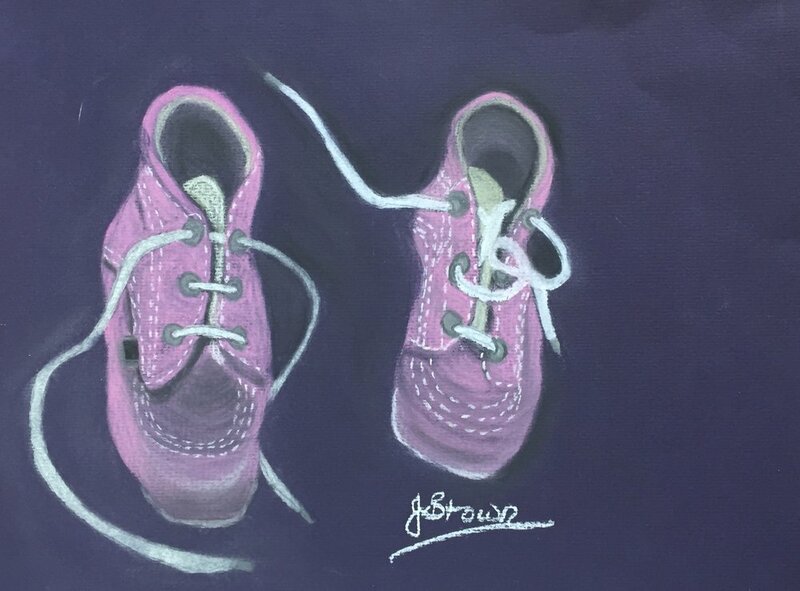 Ian explained that this painting was best completed on a dark pastel paper, preferably dark blue. After first laying down some ultramarine blue for the sky and orange for the sunset he then continued to show us how to do the moon using a circle cut out of paper to get the correct shape. Here is Ian using pastels together with completed piece of work. We had many members joining in with this enjoyablel painting. Click the thumbnail picture to scroll through the pictures. Other work by the group artists. Anne, Colin and Steve. One painting that was exceptional and worthy of a spot of its own was by by Angela Dunn painted in water soluble oils. This visit has been arranged to coincide with the junior sailing calendar. Please note if you do not wish to come to Speke Hall on the 30th August, the art club will not be in session at the sailing club on that day. The coach to Speke Hall will set off from the sailing club at 10.00a.m. to Speke Hall, Merseyside. When we arrive it is advisable to have an early lunch at the cafe or you may take your own picnic as the hall does not open until 12.30.p.m. You will be shown round the hall by National Trust guides and this is well worth a visit. There is also a tea room and small gift shop on site. Feel free to sketch and enjoy the grounds. the coach will leave from the car park at 2.00p.m. and arrive back at the sailing club for 3.00 p.m. This week was a catchup week with many members catching up on finishing the elephant painting from last weeks meeting. We had a great selection all painted in acrylic and in many sizes. Here is a display of the paintings. The paintings from left to right. Tony Jones, Jimmy Bamber, Tom Mellors, Tony Tricarai, Mick Muddimer, Avril Dixon, Anna Dawson, Steve Warbis, Angela Dunn and Sandra Surridge. Clicking on a picture brings it to full screen. If you like a picture video with music of the Elephants. We also had a excellent selection of paintings by other members. Left to right, Jimmy Bamber, Chris Bury, Steve Warbis, Avril Dixon x 2 and Ian Scott . One unusual painting and something a little different from the norm is a wonderful painting from Sandra Surridge in Acrylic which could have the title of 'Homercasso'. You can also follow Paul on YouTube, just search for BwanaFoster. or click HERE. Here a some photographs of Paul during the demonstration. There is a template to guide you in the worksheets folder, click here. A couple of paintings were finished on the day although many more are partly completed and will be finished over the week. Steve Warbis and new member Avril Dixon finished their paintings. 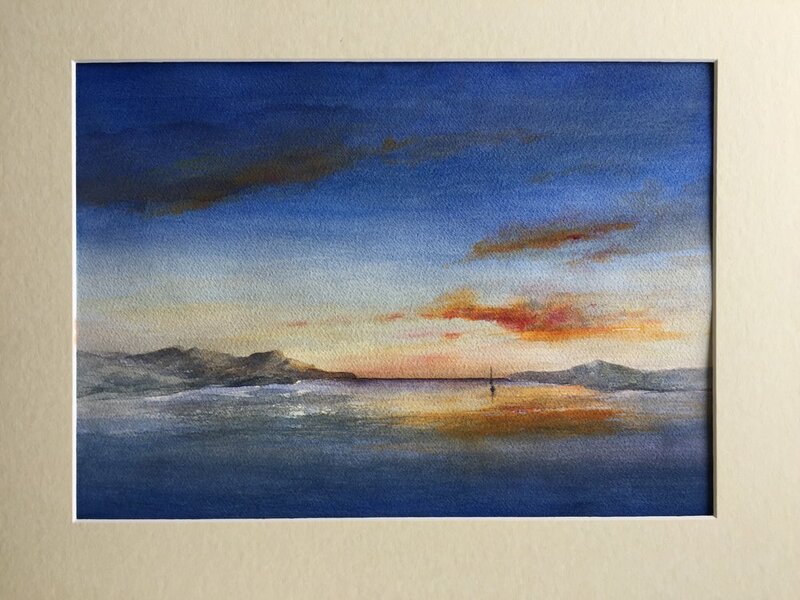 Our very own member Arthur Powell gave us a demonstration on how to do a watercolour beach and sea scene. We only had one finished painting on the day and hope to see more next week. First one is Arthur painting and also a finished painting by Steve Warbis. We also had two lovely paintings brought in by Doreen. Wigan athletic community trust organised Age uk Festival for ageing on Thursday 5 July 2018 from 12 to 4 pm. 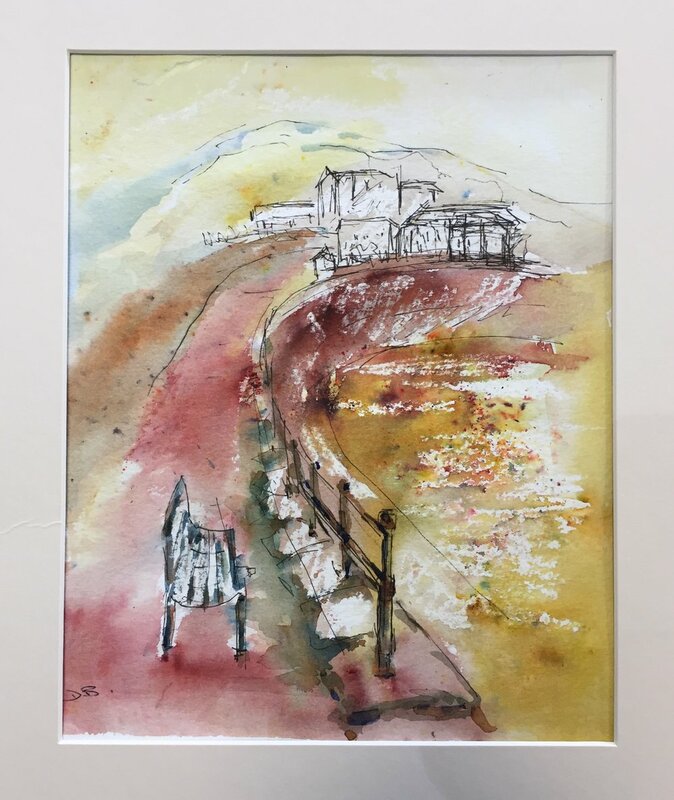 Golborne and Lowton Art Group exhibited some of their work which is also available for sale. Age Uk are supporters of our art group and we enjoy attending their events, The event was held at the DW Stadium, Wigan. We competed for attention with 20 plus stalls. Serious competition was the cake stall with daintily arranged treats! Crafts predominated with a puzzling challenge to guess the name of the knitted flamingo. Three bands entertained plus a ukulele band and Wigan Age UK singers. Around 1:30pm a tour of the stadium was available. Events happened both in the hall, rooms and outside including poetry reading, a spinning demonstration and film showings from the film society from Leigh. The Jammers entertained us with their music until the lunchtime meat pie was served. Age UK Silver Singers who serenaded the guests appeared in the last Christmas ad for the Co-op! We may not have sold at this event but many of this well attended event viewed our work and we raised our profile within the community, which is what we aim for. Diane,Tony and Anna attended. was all about catching up on all those unfinished paintings or paintings we have been intending to have a go at. We had a wonderfull range of painings on the day. 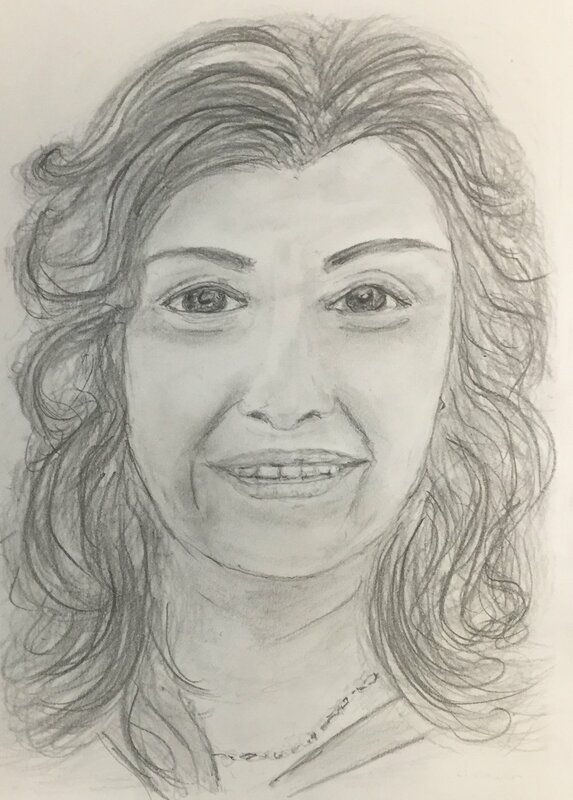 Anne Was the subject for a couple of members using pancil and charcoal. This is the collection from today. Left to right - Arthur, Tony Jones, Steve Warbis (3), Anne Houghton (2), Jimmy Bamber, Ian Scott, Sue Smallman (2), Gladies Oxely and Tony Jones. Arthur Powell, one of our club members and his brother are talented musicians. Both are playing in Golborne. If you can make it its on 7th July a great afternoon/evening in support of Heath Street Church see below. The art group are arranging a visit to Speke Hall on 30th August. Speke Hall is a cherished Tudor mansion run by the National Trust, Liverpool. The estate is comprised of gardens and extensive grounds. There are picnic areas, toilets, a tearoom and a restaurant serving fresh food locally sourced. A shop on site sells local products. As a National Trust property you will enjoy learning about the stories of Ada and Adelaide Watt: and explore what life was like especially in Victorian times from the knowledgeable guides. Adelaide was the last owner who ensured the survival of Speke Hall and grounds for everyone. There is a small charge for entry to the hall and gardens unless you are a member of the National Trust, in which case it is free. The club will pay for the coach. Please book your place on the coach with a £5.00 deposit. Total entry price is £10.00 to gardens and house payable in advance. the coach will leave the club at 10.00 a.m. promptly and be back for 3.00 p.m. Please give your name and deposit to Sue as soon as you can. 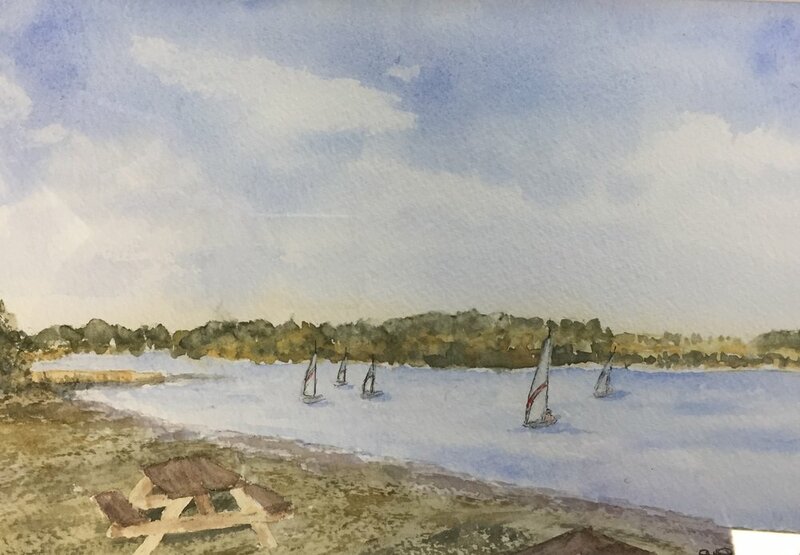 The clubhouse is not open to the art group on this day as there is a sailing event taking place. Todays meeting was about Rust. We had a few members partispating in painting although some hadn't fininshed in time and look forward to seeing them next week. The finished paintings from left to right. Tony Jones, Janet bilsbury, Mick Muddimer, Sandra Surridge and Anna Dawson. Also other painting by members completed at home and at the club meetings. Paintings left to right - by Janet bilsbury X3, Ian Scott, Steve Warbis and Mick Muddimer. Click on the image to display the painings in full size. We had guest artist Jim Bickerstaffe this week demonstrating to us how to paint a harbour wall using Acrylic. Many members participated this week in painting along. Jim's finished painting is shown here in the centre along with members engaging in the activity. We can see many of the finished paintings from top left to bottom right. Tony Jones, Jimmy Bamber, Anne Reynolds, Anna Dawson, Tony Triscary, Sandra Surridge, Janet Bilsbury, Anne Shaw and Tom Mellors. We also had a few paings brought in by members they had completed at home. The first one from Jim Atkinson of a rusty miners lamp is stunningly real. 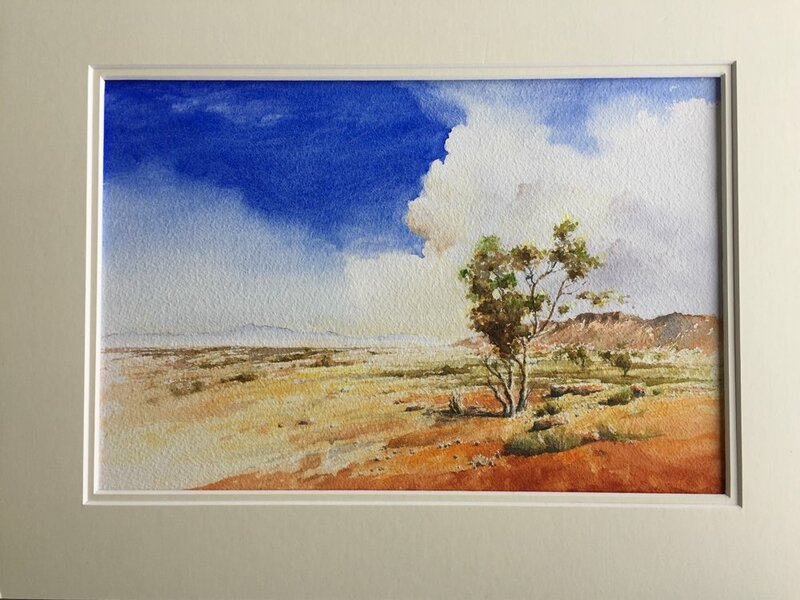 Jim works primarily in Acrylic and has achived a wonderful piece of work. Two further paintings equaly good by Angela Dunn, one of a seascape, painted with water mixable oils and a Fox in Pastel. Also a further paining of 'The washing on the line' by Tony Triscari. We will be entering the Greater Manchester Festival of Ageing 2018 5th July 12 noon - 4p.m. at the DW Stadium, Wigan. We have a table to display about 20 paintings no bigger than A4 size. A number of frames are available with a mount to fit an A4 image. Paintings can be any subject and any media. If you are submitting then please frame and place the club ticket on your artwork stating name, media, title and price if you wish to sell. The paintings will be supported by desk easels. Please make sure the paintings are given to Diane by 28th June at the latest. There will be other stalls and entertainment and all are welcome to join in the festivities. This months theme is rust, we had a few members try the rusty tractor in watercolour as suggested by Janet. There was also plenty activity putting together the paintings members had done for the mining museum at Astley green. A days painting at the mining museum. Nineteen members of the art group and two representatives from AGE UK spent an enjoyable day at the museum. The day began with an interesting and informative talk and slide show on the history of Astley Colliery by Mike Shardlow, secretary of the Red Rose Steam Society. The accompanying photographs and maps gave us an insight into the development of the colliery from 1908 to 1970 when it closed. This provided a good basis for when we subsequently explored the site and chose our subjects and landscapes for sketching and painting. We were treated to an enjoyable lunch in the museum tearooms and later, a live demonstration of the steam engine in the Engine House. A big thank you to all the voluntary staff who made this a great day for all of us. As an art group, we are contributing to the museum and learning about our social history with an exhibition of art work depicting aspects of the colliery. Members please note that any work to submit for the exhibition must be ready framed, mounted and ready to hang by next Thursday 7th June. Please have this ready and bring it to the art class by 11.00 a.m. to be transported to the museum. If there are any late submissions they must be taken by the artist themselves. Artwork should be framed and mounted to hold an A4 image. Please put a card on your work with your name, title, media and if you want to sell it ,the price. Special thanks must go to Diane for organising the day and the exhibition. Below are some photos of our visit. Many more pictures can be seen by clicking HERE. This opens in a new window, and pictures of the Miners house HERE. Also a movie of the Engine room. We have been working on a project for the Pit Museum with related subject matter. Here are some of the work we have produced and more can be seen under Astley Pit artworks on the website opening page. Click HERE to open the page in a new window..
Art group members Diane and Anna visited Lancashire Mining Museum on the 22-02-18. This unique heritage site houses the largest surviving steam engine in Europe and the surviving headgear is the last example in the Lancashire Coalfield. 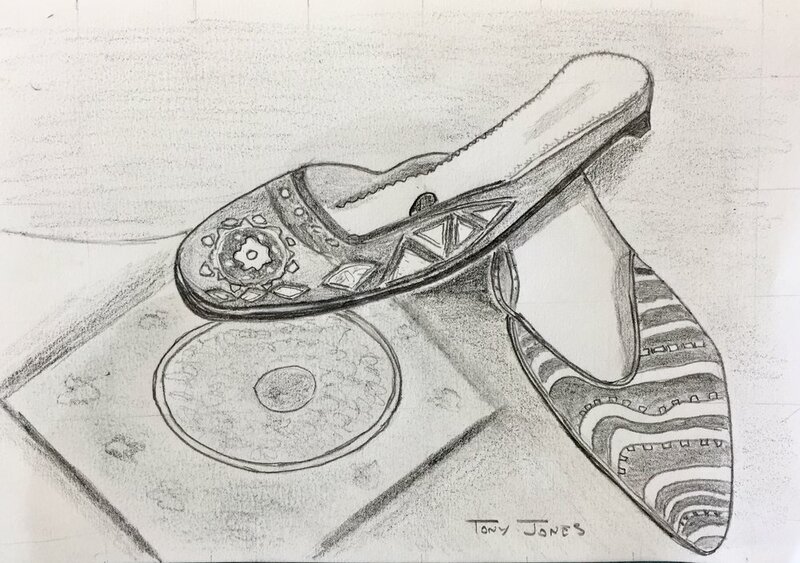 There is a wealth of interesting subject matter for artists. We are maintaining links with the Red Rose Steam Society who run the site with the prospect of displaying our mining related artwork in their visitors centre, currently being made ready. This week was a catchup week or do your own thing. We also had some paintings members brought in from home. Here we can see the many pieces of work completed. Click to scroll through. Two further pieces of work submitted worthy of a showcase first by Steve Warbis and second by Arthur Powell. 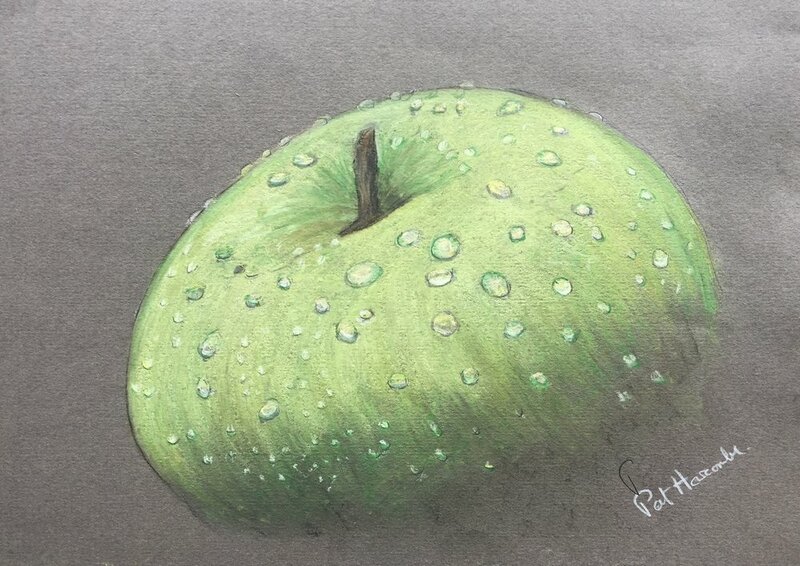 Todays theme was realism and Janet provided us with a picture of an apple. Many members enjoyed using there own preferred medium to paint there own representation of the picture. Members paintings from left to right. Tony Jones, Anne Jones, Janet Bilsbury X2, Pat Harcombe, Ian Scott, Sandra Surridge, Anne Houghton and Ann Shaw. Other work brought in by members. John Morris, Sue Smallman X2, Jimmy Bamber and Margaret Hayes. 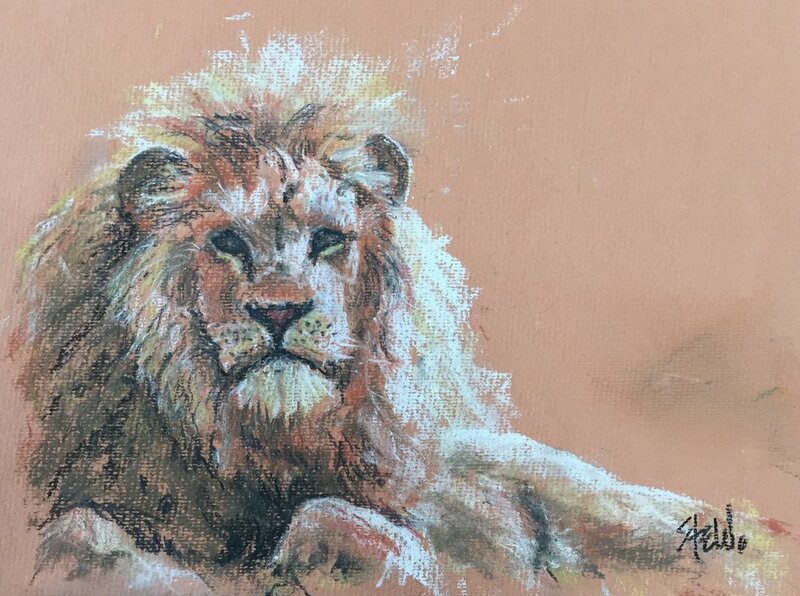 Ian treated us to a demonstration / workshop of a Lion Study using pastels. Here we can see Ian busy with his painting and to watch the video this link. Many members joined in today and produce some wonderful work. From Left to right - Tony Jones, Colin Lowe, Mick Muddimer, Steve Warbis, Sandra Surridge, Jimmy Bamber, Anne Houghton, Janet Bilsbury, Anna Dawson, Angela Dunn and Tom Mellors. Other works from previous weeks included from left to right. Chris Bury, Pat Harcombe, Angela Dunn and Anne Houghton all done in pastel. Also an update to Diane's painting of the engine room at 'Astley Mining Museum'. On Thursday 31st May, there will be no club meeting at the Sailing club, as the children have their bi-annual meeting for the day.As an alternative we have arranged a planned visit to Astley mining museum Higher Green Lane, M29 7JB just off the East Lancs Road at Astley Meeting at 10.30 until approx 2.30..
We have negotiated a days visit to the museum and members of the Red RoseCharity will be available to present the history of the pit. The day will be hosted by Trevor Barton MBE and we are lucky to be able to arrange this. We will have the morning creating artworks and then break for lunch followed by a talk from the volunteers at the Museum and the Red Rose Society. Looks like an interesting day. Can members please ensure that they let us know if you are attending this event as the museum are providing lunch for us and refreshments for us at the minimum cost to us and this needs to be preordered. Can members make their own way down to the museum, anyone who needs transport, please let us know, so arrangements can be made for possible car sharing. You will each need to take your drawing, painting materials enough for the day so that we can take advantage of this interesting venue. Hopefully the weather will be kind to us but can I suggest you wear suitable footwear and jackets whilst we will be outside for some of the time though their is a class room for us to use. 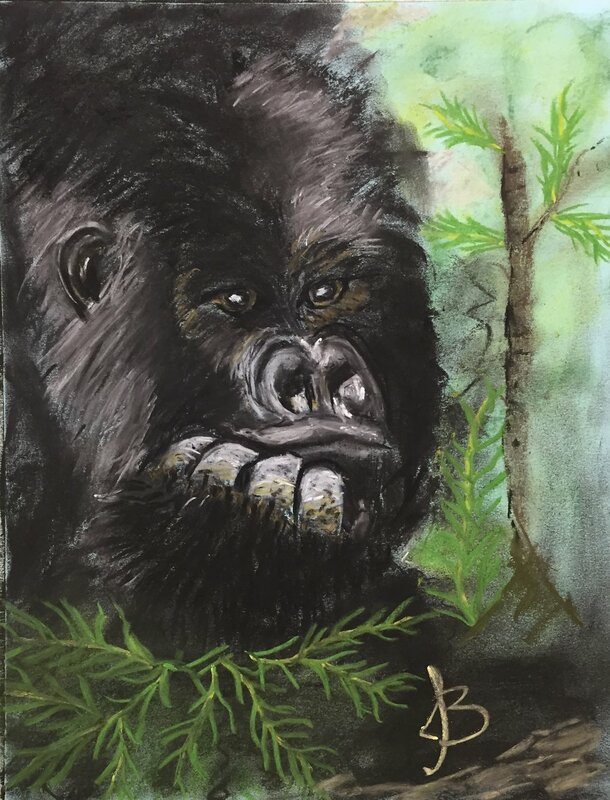 Janet demonstrated to us how to start drawing a Gorilla using pastels, by being with the nostrils using techniques that give it depth. Here are a few of the finished drawings from Tony jones, Steve Warble, Jimmy Bamber, Jim Atkinson and Mick Muddimer. Other paintings by members. Chris Bury, Diane Bloxham, Tom Mellors (3), Angela Dunn (2), Pat Harcombe, Sandra Surridge (2), Steve Warbis and Anne Houghton. Todays meeting was a catchup day, members finishing off painting or doing a painting that they have been meaning to do. We had a various selection of paintings at the end of the day. The paintings left to right are Tony Jones, Mick Muddimer (2), Anne Houghton, Anna Dawson, Diane Bloxham, Tony Jones & Tony Triscari. One painting worthy of being showcased is an Acrylic painting of Astley mine by Jim Atkinson. Astley Mine - Lancashire mining Museum, Astley. Paint like Lowry was todays theme and a few members made there own interpretation. Hopefully more will appears next week. Lowry paintings from Left to right, Tony Jones, Tony Triscari and Anne jones. Other paintings brought in by members this week by John Morris, Arthur Powell, Tom Mellors, Tony Triscatri, Ian Scott and Jim Atkinson. Click the images to a larger picture. 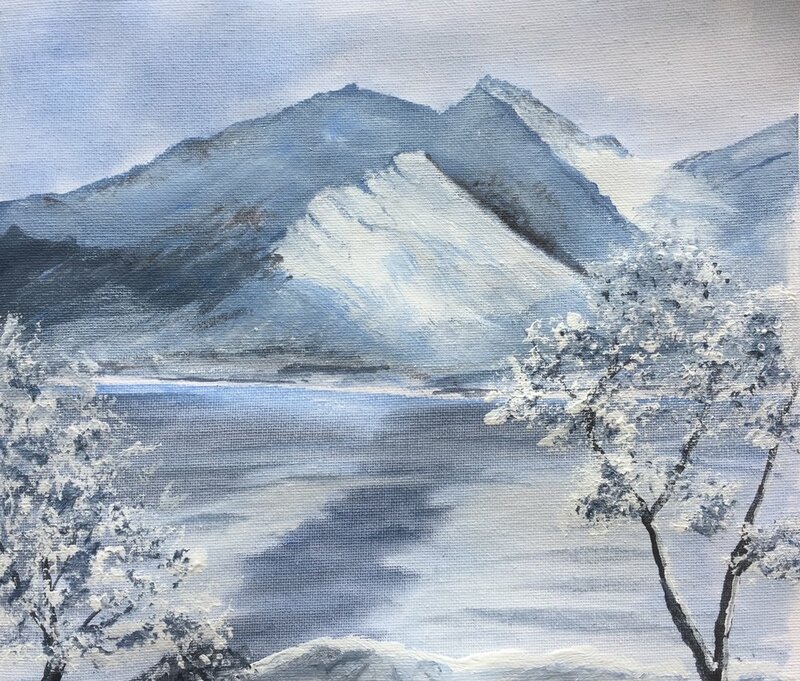 This weeks theme was snowy mountains and lakes as suggested by Jim Atkinson. Members produced a variety of paintings in different mediums. 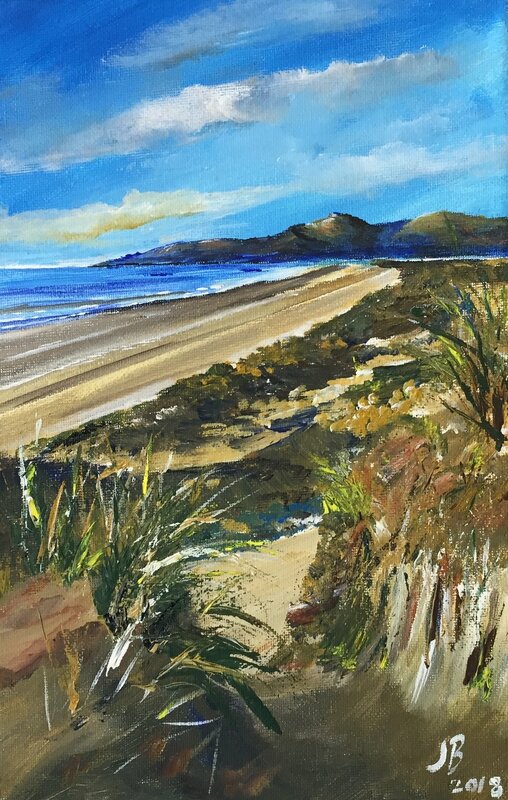 Paintings by Arthur Powell , Ian Scott , Anne Jones, Tony Jones, Chris Bury, Steve Warbis, Sandra Surridge, Mick Muddimer, Sue Smallman. Other work produced by members. Two industrial Acrylics by Janet. Boat by Margaret, Nuts and Bolts by Chris Bury. Pots by Pat, Canal Scene by Colin, Pen and washes and a mine by Steve Warbis. Boat scene and mining trucks by Anne Jones. This week Janet provided a Palette knife workshop doing a garden flower with distant trees. Here is Janet doing the demonstration. with member artist producing there own work. Here we have some finished paintings by members from last weeks Steve Williams workshop by Tony Jones, Arthur Powell, Steve Warbis, Chris Bury, Tom Mellors, Tony Triscari and Sandra Surridge. We also had other work done at home by Sue, Steve and Tony Triscari. Steve Williams was with us today doing a seascape in Acrylic. Members painted along and we hope to see the finished paintings soon. Here we can see Steve's finished painting. 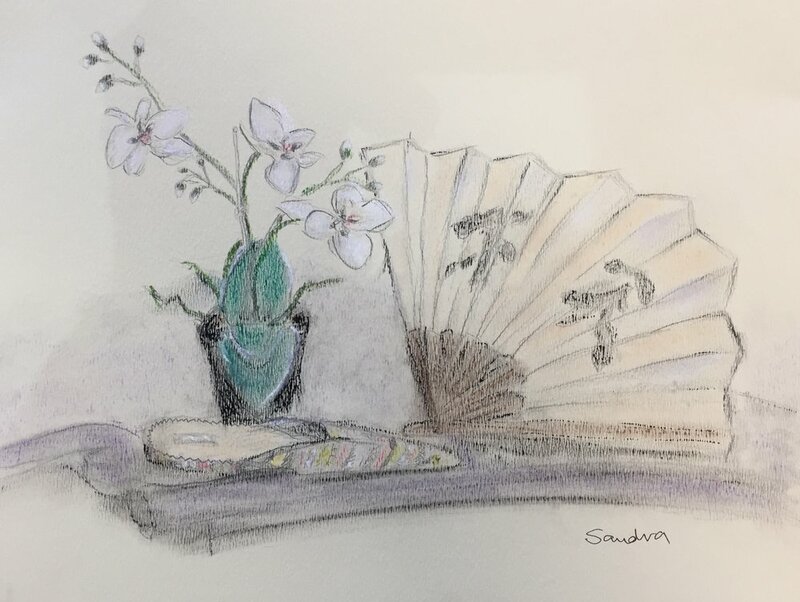 Todays theme was still life drawing as suggested by Chris Bury who brought in many items for us to draw, with many thanks to Chris. Here we can see all the displays we could choose from. Drawings from Anne, Tony T, Steve, Joyce, Tom, Angela, Tony J and Sandra. Ian decided to do his own still life. 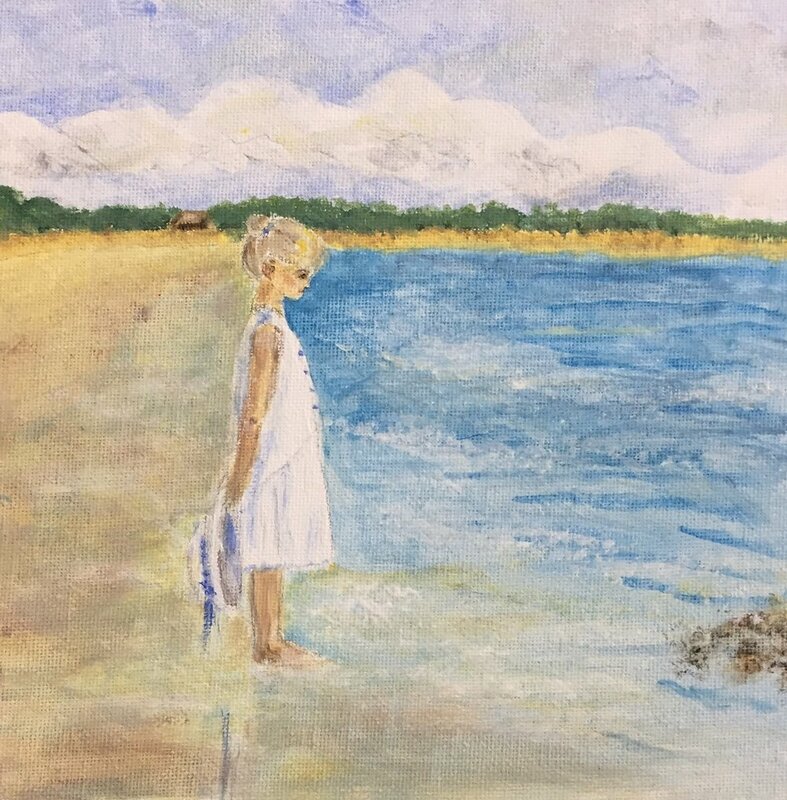 This weeks theme was to make one painting from two photographs and to incorporate children on a beach. Only a couple managed to finish them and hope to have more in the coming weeks. Here are a two from Sandra and Mick. From Tony Jones. Golborne station. Also some wonderful charcoal drawings form Jim Atkinson. Other work done during the past week by members, three pen and washes by Steve Warbis and a sculpture by Annie. Members trying a painting using just one colour. Click on the picture to see a larger view. Here we can see paintings by Sandra Surridge, Steve Warbis, Joyce Brown, Annie J. Janet Bilsbury , Ian Scott,Tony jones and Tom Mellors. Other work done by members over the past week included work by Arthur and Steve. During the last few weeks Janet and Ian have been away doing painting holidays and here is Janet work. 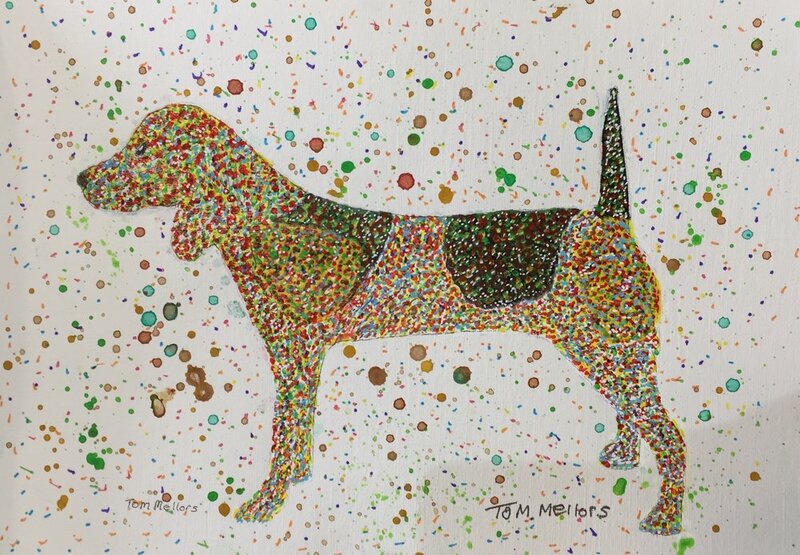 This weeks Showcase is a wonderful oil painting by Tom Mellors. Today we had our very own Arthur demonstrating to us how to do clouds. Step by step he explained the process of laying colour to produce Cumulus clouds receding in to the background to produce distance. Here we can see Arthur at work, and his finished painting. Here is a selection of finished paintings by members. Angela Dunn, Tony Jones, Mick Muddimer, Sandra Surridge, Tony Triscari and Jimmy Bamber. We were a bit thin on the ground today due to other members being away on a painting holiday run by Ian and Janet. Tony Jones, Annie J, Anne Reynolds and Steve Warbis. We also had some work done over the past week by Steve Warbis and Pat Harcome. - Watercolour. We were treated to a workshop today by our very own member Arthur Powell. 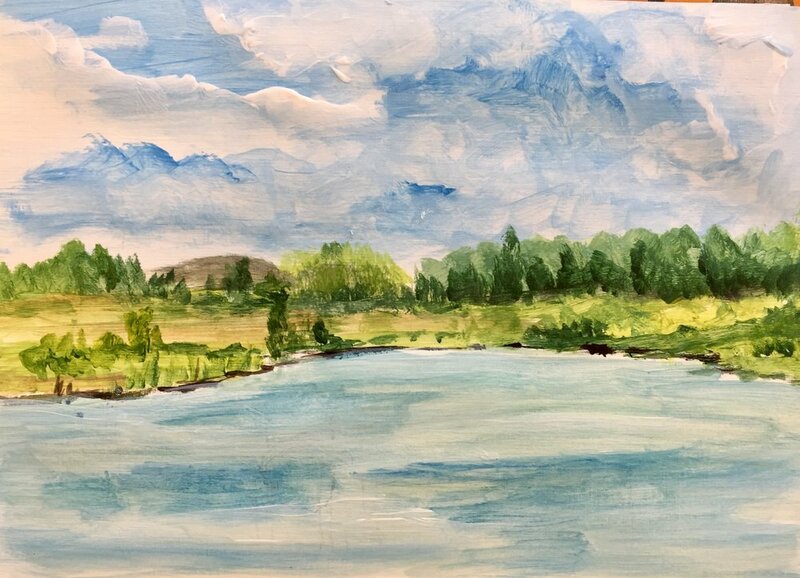 Arthur took us through producing a landscape in watercolour from his own perspective and developed the painting without a drawing or picture, Just making it up as he went along. Here we can see Arthur at work. This is the work of a few members, some didn't finish so hopefully we will have more next week. From left to right - Tony Jones, New member Steve Warbis, Joyce Brown and Tony Triscari. Some member did there own thing. Left to right, Mick Muddimer, Sandra Surridge and Jimmy Bamber. We had some more additions to the portraits from last week. Tom Mellors painting his self portrait. Committee members held a meeting and the following events or projects are or have been arranged. This year our focus for a group project is entitled ‘Now and Then’ following on from the heritage theme last year. We have a collection of reference photos for our members to use, which would particularly lend themselves to pen and wash. The photos are mainly concerned with buildings and occupations around the Leigh area at the time of the industrial revolution. The aim of the project is to contrast two paintings from that time to what is in place now. Members may find that they have some existing paintings that may be a start to the ‘Then’ aspect. Some photos may be seen on a heritage gallery on the website. 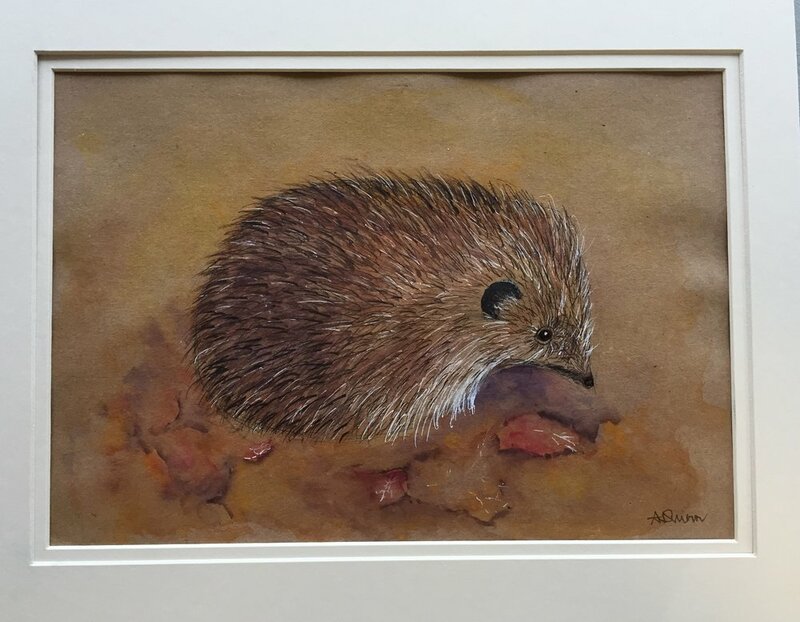 the group has arranged with Paul the manager of Leigh Pensioners Link in Charles Street a display space for up to 25 pieces of our art work mounted and framed maximum size 30 by 40 cms. This would be on Long term loan until January 2019. Would our members please submit their work for display to Diane between Thursday 8th March and Thursday 22 nd of March. These works can be for sale. Opening times Monday to Friday 9:00am to 5:00 pm to view. Continuing with the theme of charcoal portrait, here we have examples from Jim Atkinson (x2) and Angela Dunn (x2). Other members doing there own thing worked on a variety of subjects.From left to right, Linda Todd, Chris Bury, Tony Jones, Annie, Sandra Surrige, Sue Smallman and Arthur Powell. We had a guest artist visit us today. Jim Bickerstaff demonstrated how to do a portrait using charcoalHere we can see Jim along with examples of our club members work, (there are a few duplicates) some excellent work was produced..Ian was posing, sorry modelling in the last photograph. Happy New Year to everyone. Todays meeting was the first for this year and The theme for the month is faces and people. Janet demonstrated to us how to break the face down to component parts of the face to get the correct proportions. A few members got involved and produced some excellent work. Left to right - Ian Scott, Jim Atkinson, Jimmy and Tom, Jimmy and members participating.